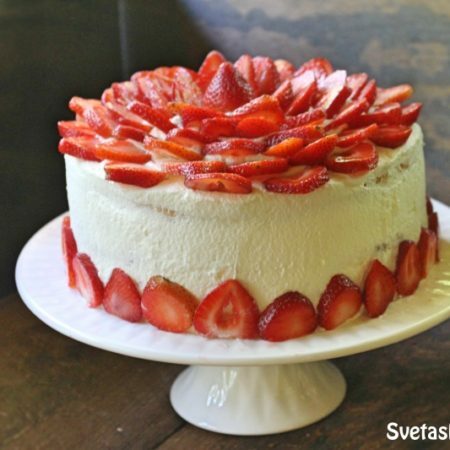 Sponge cake layers covered with cream and topped with fresh strawberries, makes for one light tasting cake. 1.) To start the recipe split your eggs into yolks and whites, add your egg whites into a mixing bowl and beat on a high speed while adding 1/2 of your sugar until soft peaks form. Add the other 1/2 of your sugar to your egg yolks in a different bowl and beat with a hand mixer until it rises a little. Add your egg white mixture to your yolk mixture and mix together well with a spatula. Add your sifted flour while mixing with a spatula. 2.) Add baking powder, mix and pour your dough into cake forms that have tin foil with cooking spray. Smooth out the top with a rubber spatula and bake your layers for 30 minutes or until toothpick inserted deep into center comes out clean. Beat your heavy cream for 4 minutes on a high speed, after add condensed milk and beat for another minute. Take out your cake layers and let them cool on a cooling rack. 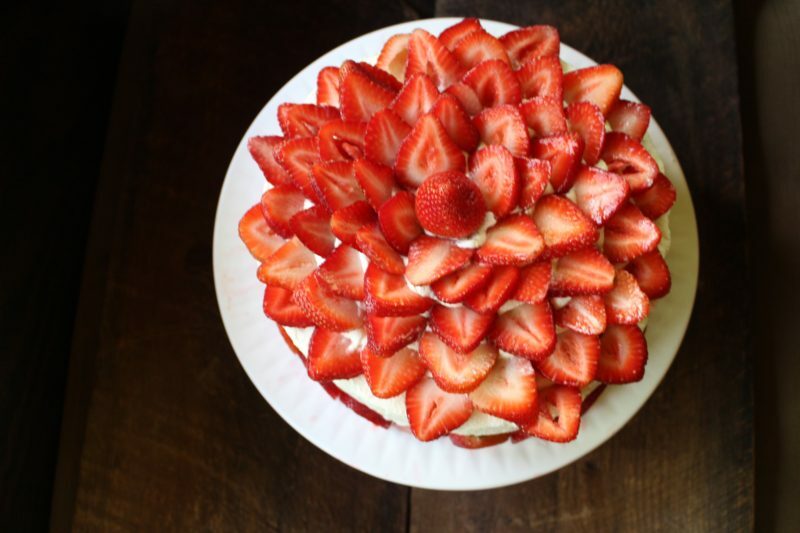 Wash, dry and cut your strawberries, also cut your cake layers into 2 so you have 4 layers. 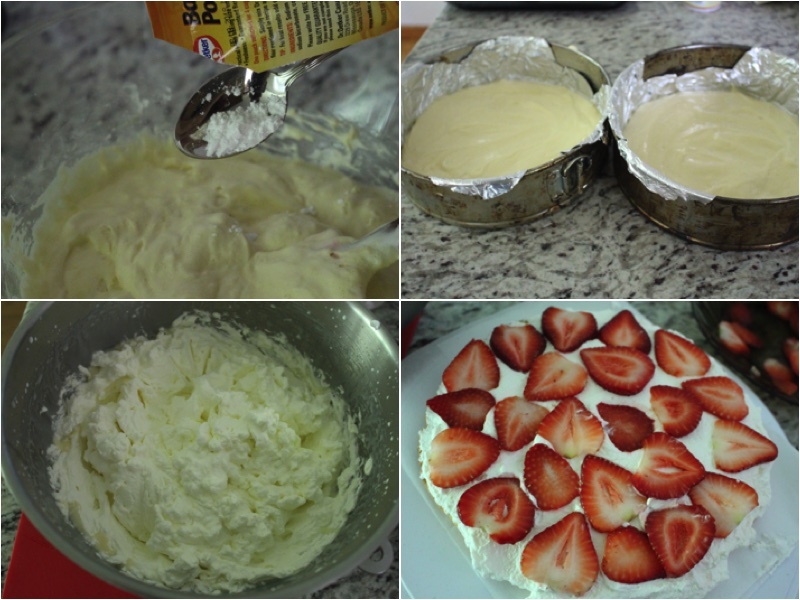 On each layer add strawberries and cream, build up all 4 of your layers and frost the outside of your cake. You can create any design you desire on the top of the cake. Cut and enjoy! To start the recipe split your eggs into yolks and whites, add your egg whites into a mixing bowl and beat on a high speed while adding ½ of your sugar until soft peaks form. Add the other ½ of your sugar to your egg yolks in a different bowl and beat with a hand mixer until it rises a little. 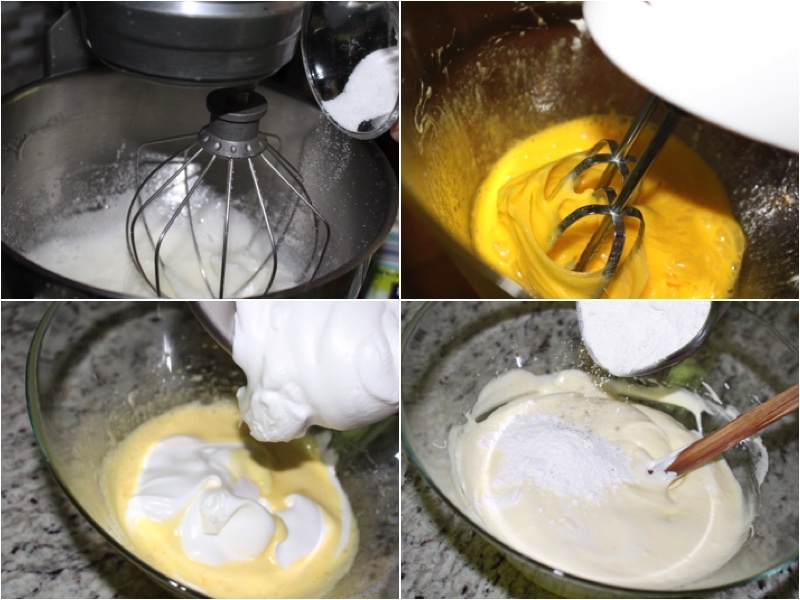 Add your egg white mixture to your yolk mixture and mix together well with a spatula. Add your sifted flour while mixing with a spatula. 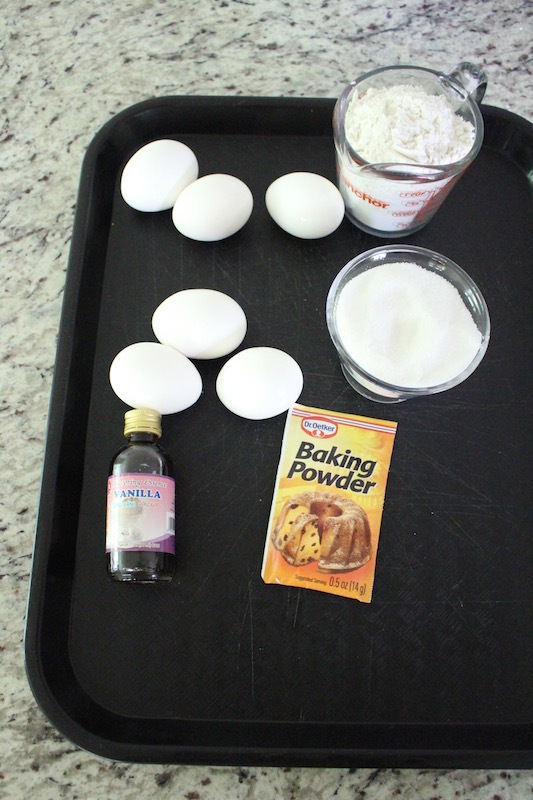 Add baking powder, mix and pour your dough into cake forms that have tin foil with cooking spray. Smooth out the top with a rubber spatula and bake your layers for 30 minutes or until toothpick inserted deep into center comes out clean. 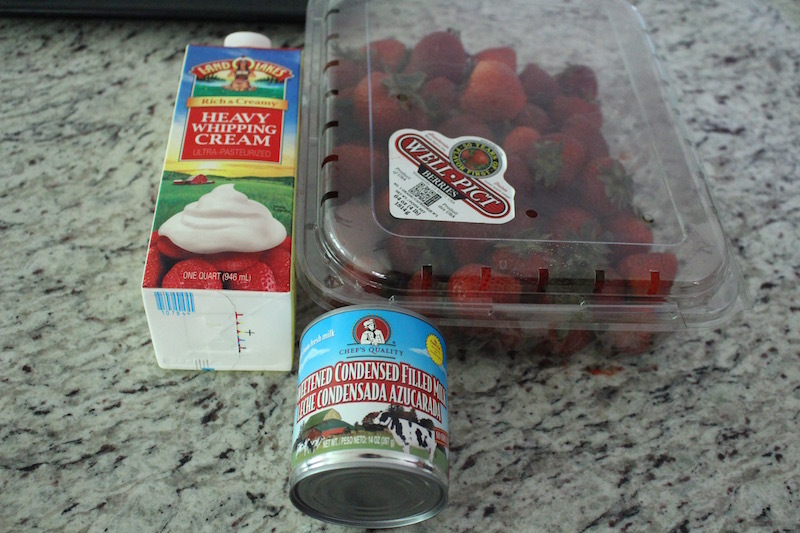 Beat your heavy cream for 4 minutes on a high speed, after add condensed milk and beat for another minute. Take out your cake layers and let them cool on a cooling rack. Wash, dry and cut your strawberries, also cut your cake layers into 2 so you have 4 layers. 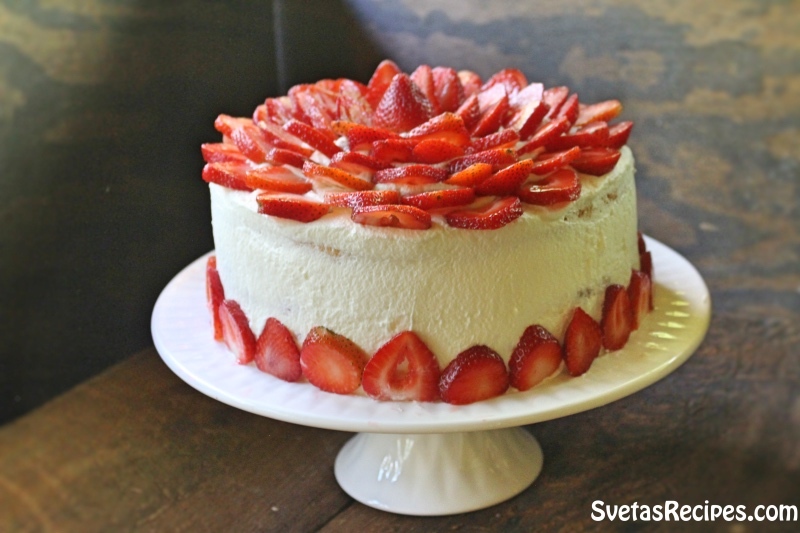 On each layer add strawberries and cream, build up all 4 of your layers and frost the outside of your cake. You can create any design you desire on the top of the cake. Cut and enjoy!